More space, more power, more goosebumps – the new Mercedes-AMG GT 4-Door Coupe delivers driving experiences in new dimensions and extends the AMG model family. The new Coupe is the first four-door sports car from Affalterbach and draws directly on the legendary SLS and AMG GT models of success. 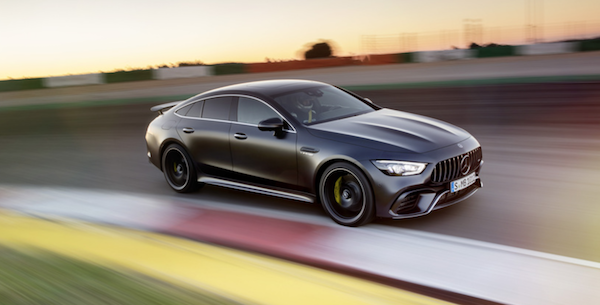 As another vehicle developed autonomously by Mercedes-AMG, it combines unique design, high comfort and outstanding sports car engineering with an athletic, four-door fastback layout. This means that it offers more space and even greater versatility. It thus offers more space and more potential uses. The systematic expansion of the AMG GT family with the 4-Door Coupe opens up the sports car segment to those looking for a vehicle for day-to-day use, but who are unwilling to go without the unparalleled performance of Mercedes-AMG. Longitudinal and lateral dynamics at the highest level and a striking silhouette with classical proportions immediately put the Mercedes-AMG GT 4-Door Coupe in the portfolio of its two-door brother at first glance. The expressive design with a low hood, dominant front and muscular body language emphasizes the sporty genes of the four-door coupe, which sets new standards as the latest model in the AMG family. The new AMG GT 4-Door Coupe combines high everyday comfort with diverse individualization options and the latest sports car engineering. “The new AMG GT 4-Door Coupe blends the impressive racetrack dynamism of our two-door sports car with maximum suitability for everyday use. It has a unique way of embodying our brand core, “Driving Performance” and with its systematic configuration it will attract new customers for Mercedes-AMG,” commented Tobias Moers, CEO of Mercedes-AMG GmbH. The new AMG GT 4-Door Coupe delivers special driving experiences on all levels, and with a top speed of up to 195 mph it ensures superior performance in any situation. Powerful, up-to-date in-line 6-cylinder and V8 engines with outputs ranging from 429 hp to 630 hp allow completely new driving experiences and combine impressive performance with modern efficiency. The interior of the first four-door AMG GT model is characterized by elegant coolness and also by ultra-modern features: innovative controls can be intuitively operated and configured as required. The blend of high individualization and sports car technology, placing yet more focus on the requirements of discerning customers, is also clear from the wealth of equipment packages and individual options. Moreover, the latest addition to the family from Affalterbach also lives up to the Mercedes-AMG brand pledge with regard to its high driving dynamics and sets the benchmark in its segment on the racetrack too. Print article This entry was posted by Art Eddy III on March 14, 2018 at 10:58 am, and is filed under Cars. Follow any responses to this post through RSS 2.0. Both comments and pings are currently closed.